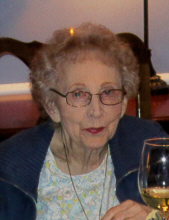 Mary Ann Lesner, 89, passed away Wednesday, January 30, 2019. Devoted daughter of the late Frank and Gertrude (nee Moore) Neville. Preceded in death by her husbands, Marvin Johnson, Sr. and Edward Lesner, Jr.; daughter, Donna Lee (Robert) Witt; great-grandson, C.J. ; siblings, Eleanor, William, Charles, Barbara and Richard; son-in-laws, Leonard Nicpon and Wayne Van Boven. Mary Ann is survived by her daughter Pamela Van Boven, Marvin Johnson (Paulette) and Marta Kadlec; 15 grandchildren and 28 great-grandchildren; her sister Patricia (the late Tom) McDonald and her sister-in-law Geraldine (the late Charles) Neville. Mary Ann was a devoted Cubs and Bears Fan and loved a good game of pinochle. In lieu of flowers memorials may be given to the American Cancer Society. Funeral Information and condolences can be given at www.GlueckertFuneralHome.com or (847) 253-0168. Visitation Friday, February 1, 2019 from 3:00 pm until 8:00 pm at Glueckert Funeral Home, Ltd., 1520 North Arlington Heights Road (four blocks south of Palatine Road), Arlington Heights, IL 60004. Services and Interment will be private. "Email Address" would like to share the life celebration of Mary Ann Lesner. Click on the "link" to go to share a favorite memory or leave a condolence message for the family.